In the year to end January 2017 new build house prices rose on average by 5.8% across the UK which is down on last year’s figure of 7.2%. But if Greater London is taken out of the calculation and we take a crude average of the remaining regions, then the average house price growth is 4.4% compared to a figure of 4.1% last year. LSL Land & New Homes comments; “Looking across the regions it can be seen that the overall change in the growth rate is the result of some strengthening at the bottom end and mid range of the regional performance table and weakening at the top end. 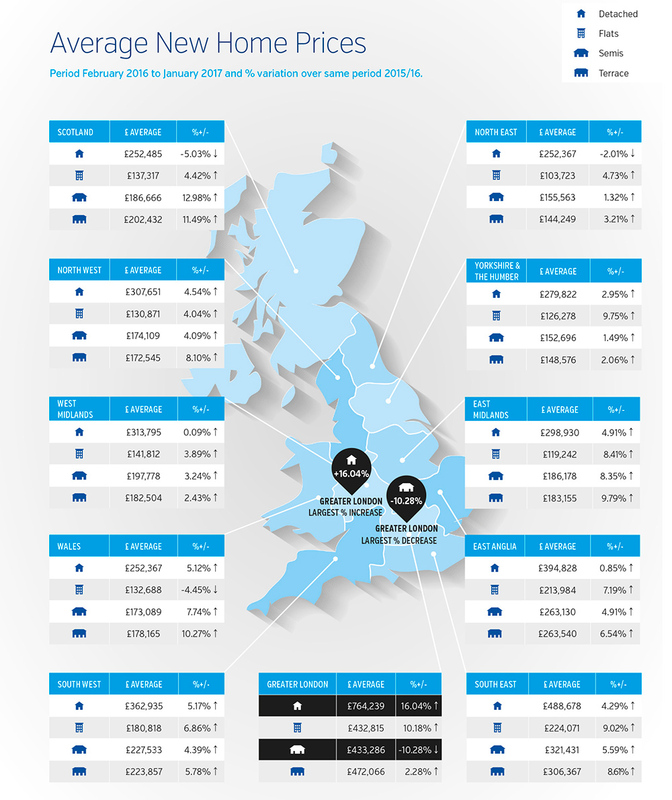 It is very interesting to note that in the year to end January 2016 four of the eleven regions tracked were showing price growth of over 5%; in the year to end January 2017 six of the regions (more than half) were showing price growth of over 5%. In the year to end January 2016, Greater London had been knocked off the pole position by East Anglia and was coming under threat from the South East. However over the past year Greater London has regained its pole position with growth of 9.4%, the South East takes equal second position along with the East Midlands at 7.3%. There then follows a number of regions showing respectable growth levels (being well over double RPI inflation). The South West 5.6%, Wales 5.3% (up from just 1.5% last year), the North West 5.2% and East Anglia 4.8% all have growth in the 5% band. Yorkshire & the Humber 3.2%, the West Midlands 2.1% and Scotland 2% are now into above RPI inflation growth and only the North East at 0.7% does not achieve this level of growth.